On the island, there are two well-marked walking/hiking trails. The trail-head is located at a gable wall 50m from pier. From the trail-head follow the surfaced road for 100m past the church (on your right). There is the shorter trail that sweeps around the island past Loch Cúil a Chnoic in an anti-clockwise direction but the longer trail is superior, offering up some wonderful scenery from the cliffs at the rear of the island. One of the island’s most interesting sights, “The Spirit of Place Sculpture”, designed and built by American architect Travis Price. This is the first point of interest – planted in a fascinating and panoramic location for a post-modern piece of sculpture. It's a poignant dedication to the families of Inishturk and the ideal place to sit down and gaze out at the sea. The Cliffs: These are only on show if taking the longer trail. This is as rugged as it gets and thankfully one of the island inhabitants had the foresight to erect a seating bench right at the cliffs! On a fine summer's day in Ireland - it doesn't get any better than this. It's idyllic. Inishturk Football (GAA) Pitch: Surrounded by rocky mountains on three sides, it's a football pitch that appears out of nowhere as you’re coming up the road. A natural amphitheatre – it is perhaps one of the most unique sporting facilities in the country. Port An Dun: Another noteworthy site worth visiting. A natural secluded lagoon that provided the ideal cover for the Norse raiding parties. Port An Dun is right of the football pitch and many take a dip into its tempting waters on a fine day. 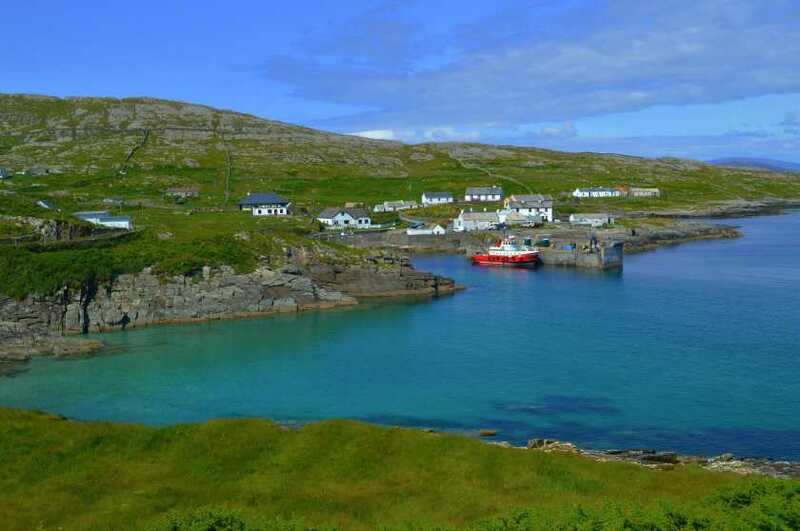 Two great beaches near the Inishturk Community Centre: Tranaun and Curran beaches. Unspoilt with crystal clear blue water another ideal place to swim or just watch the sun go down on what locals claim to be the best views around.